A dining room chandelier (or other hanging fixture) traditionally hangs above the center of the dining table and is a primary design feature in the room. This means that the chandelier's height is important not only for its function as a light fixture but also for its role in the overall room decor. If this sounds more complicated than you had hoped, it probably is. But don't worry: you can start with the standard height recommendation and make a few simple adjustments from there. And the fact is, you can't really get it wrong; if you like how it looks and the lighting works well, you've done it just right. The standard recommendation is, of course, an average range, and there's a good chance your chandelier will end up between 30 and 36 inches above the table, but before you settle on a height, consider the room size, the table size, and the light that's projected by the fixture. Some designers contend that the ceiling height shouldn't dictate the height of the chandelier. This makes perfect sense if you consider that the primary role of the fixture is to illuminate the table. So why adjust for ceiling height or overall room size? The answer lies in the other principal role of a chandelier—that of a design feature. With this role in mind, the next question is, how does the fixture look best in the room? To answer this question, consider how the chandelier looks not just when you're seated at the table but also how it looks when you enter the room or are seated elsewhere, such in a chair away from the table. If the dining room is part of an open floor plan, consider how the chandelier looks from every commonly viewed angle. 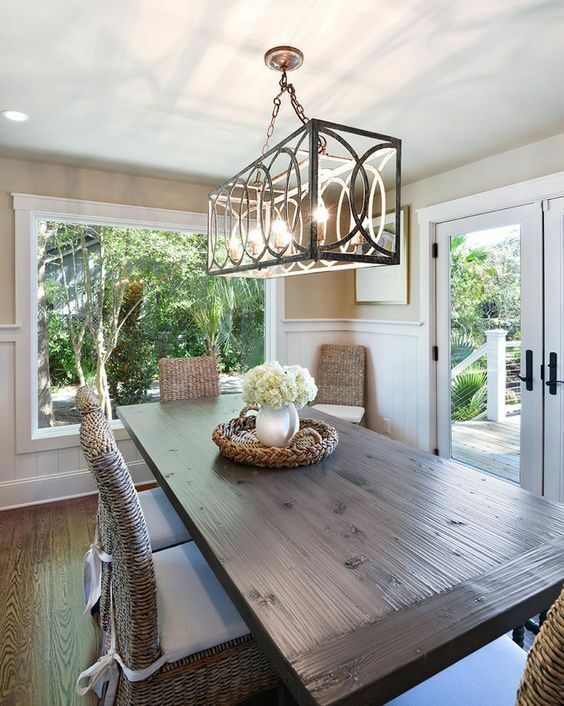 The lighting industry's standard recommendation for sizing a dining room chandelier is that the diameter of the fixture should be one-half to two-thirds the width of the dining table. Another way to size a fixture is to choose a diameter that is 1 foot smaller than the table width. For example, if the table is 42 inches wide, the chandelier should be no more than 30 inches across. With so many decorating concerns, it's easy to forget why you have a chandelier in the first place: to light up the table. For this, there is no standard industry or decorating rule because each light is different. How light is cast onto the table is affected by many things, including the fixture design, the light bulbs you use, and, of course, the height of the fixture.